Should tennis follow football's lead? 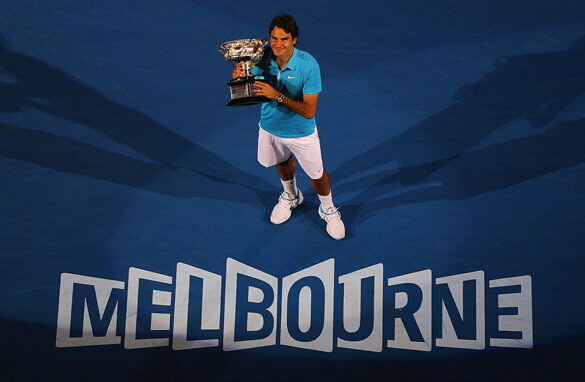 Roger Federer claimed the 2010 Australian Open, but should the season's first grand slam take place in January? Nearly every tennis fan has a favorite major. It’s usually based on nationality, location or court surface. My favorite is Wimbledon – I am British, from London, and love grass-court tennis. But, like the other three slams, the All England Championship has its pros and cons, which differ depending on whom you speak to. The biggest con of the player and fan-friendly Australian Open, in my opinion, is definitely the timing of the tournament. I just don’t understand why the first major of the year has to be in the first month of the year. There are four slams and the first one comes just as the season begins. It’s crazy! There is very little build-up - two weeks of official tournaments - which hurts the anticipation of the tournament, and the scheduling could very well be a factor on the injury front. The tennis off-season is short enough and the January Australian Open means players have to start preparing in early December. You can’t just take six to eight weeks off and then roll into Melbourne expecting a) to win and b) not to get injured. The heat is also a major factor. January "Down Under" is the height of the Australian summer and more often than not the tournament’s extreme heat policy goes into effect sometime during the fortnight. The general public is told not to exercise, but the tennis continues, albeit with the bigger names playing under a retractable roof. In previous years, searing temperatures have dissuaded the fans from turning up which leads to empty seats and tempers the atmosphere. It doesn’t have to be this way. The answer it seems is simple. Play the Australian Open later in the year – mid-February would be fine. It would give the players more time to prepare and wouldn’t be quite so hot. Yes, the calendar would have to be changed but not overly so. While they were at it, the Grand Slam Committee could also agree to add a couple more weeks in between the French Open and Wimbledon to allow the players to have more time to transition from clay to grass. If football's ruling body FIFA can seriously consider moving the 2022 World Cup to January to avoid Qatar's summer heat, surely tennis can push the first major of the year back a bit? It just makes sense. Nice idea, give the players a bit of break. If the tennis off season is so short, why do the players need more time to warm-up for the Aussie Open? Surely, they've not had time to lose their fitness and timing from the previous season? Also, there are tourmaments played before the Aussie Open - the Qatar Open, Hopman Cup, Sydney International for example, should they be moved as well to accomodate a later start in Melbourne? If so, where do you put them when players already complain about the calendar being too crowded and intense? Also, the Aussie Open is positioned to be held in the middle of the Australian summer in part because all the kids and college students are off school, many people are on vacation, and attendances can be maximized. Moving it to February when everyone's back at school and work could actually decrease attendance, which actually hit record levels last year if the writer had bothered to check. Sure, its hot, but at least the show court has a roof, unlike at the U.S and French Opens which are open to the elements with the resultant delays extreme weather causes. Plus, the summer weather contributes to the happy atmosphere of the tournament, especially when you're watching it from the wintry northern hemisphere. If you remember, the Aussie Open used to be played in December as the last major of the year but was moved to January in 1987. Now reverting to a December tournament as the grand finale to the season would make sense and would still place it in the Australian holiday period, but I doubt the organisers of the WTA Championships and ATP World Tour Finals would accept being upstaged at the end of the season, so I think the date of the Aussie Open is best left where it is. Definitely it's something to keep in mind! I suppose that there are commercial interest behind (as usual). I just can think one of them: Vacations. I suppose that this is the time when lots of people are taking some time off, even because of the summer in Australia or winter's holidays in other countries; In fact, the Australian Open used to played in December. I'm not sure, but maybe that's one of the reason to keep the Aussie Open in such illogical date to make suffer players and people at the stadiums the intense heat. Why – well because Fifa is one of the most corrupt organisation in the World – and the fact that they picked Qatar for the 2022 world cup smacks of money. They are hardly moving the World cup to January to give all the possible footballers a break! They are only doing it because any time of the year the temperature will be about 40C and they don't want to be seem not be 'green' by having to air condition all the games! I agreethat Feb. would be a good time for the 1st open.I think all athletes need a 'proper' break between seasons.So many get badly injured through over play! I think a MAJOR reason why it's held in January is that it is summer holidays so a lot of families can attend the tournament. In Australia, university goes back late Feburary but school kids go back to school late January (so pretty much right after the tournament ends). I makes so much sense that it probably doesn't have a chance of being adopted but I've have been surprised before. Great idea. These physically-plagued schedule issues have been high-debated for years among players and media and fans. Nonetheless, little has changed. But last year ATP announced that they they will shorten 2012 schedule, which, only by 2 weeks so still a little change though, may be the first step to shed a light on those problems. Some players have also said Australian season should be moved. Many players are struggling with searing Australian hotness and extreme heat policy kicks in every year. Candy, your idea is on player's side, great, convincing. Though it takes quite a bit of time and enduring effort to change something conventional, this kind of proposal is valuable to make it come true someday. I'm sure the players would appreciate this, doubt it'll happen. FIFA, it seems, are led by their wallets. I totally agree with Candy's comments for both the Australian Open and Wimbledon. After the French Open the players have very little time to adjust to the grass and it seems a pity there are two Open tournaments virtually back-to-back, on different surfaces. I don´t think the aussie open should be moved to february. One of the great thing about tennis is this, at least for me it is: You get through all that christmas frenzy a few days to new years eve, and almost on the first day of the new year, the net is up, the cans are opened and they´re out there begining a new season. You can almost smell the spring is coming, a new chance to change your life and do new things. It´s great, and everyone can allready conclude from what i´ve just written, that i love that time of year. It´s so refreshing. Further more i´ve to say, i love the australian open, it´s an all time fave, and i live in Denmark, so this is clearly not based on nationality or anything else, for that matter. The discussion about changing surfaces in a week, hey get a grip, that´s the beauty of this game, and a great way to show that you´re a pro. stop whining. It´s the name of the game, and it only adds to the exitement. Candy,have you ever spent February in Melbourne?It's slightly hotter than January.Plus,all the marketing of the tournament is based on the "party" atmosphere that you can get in January with plenty of children turning up. Why would the organizers want to change what has worked so well in the past? P.S.I have never heard of the government telling people not to exercise in hot weather. That sounds really sensible to me. I wonder how the players view the January tournament? But I do think more time between Roland Garros and Wimbledon would be good for players and fans alike, though I'm pretty sure neither would want to give way! part of this article is incorrect. I live in Melbourne and Febuary is acually the hottest month of the year. Good points – but – have you ever been to Australia in February? It is easily the hottest time of the year. February is frequently much hotter than January in many parts of Australia, including Melbourne. Also, by February almost everybody has gone back to work or school and won't be able to attend many games. In January many people are still on their summer holidays and can attend. I agree with the points about it being more difficult for the players, but I don't think that will mean enough to the organisers to change things; they need people to attend the games to keep the thing going.